Learn More - Southern Tier Health Care System, Inc.
​and the Cribs for Kids Program! How does the Cribs for Kids Program Work? When it comes to babies, safe sleep is as easy as ABC. Babies sleep safest Alone, on their Backs, in a Crib. 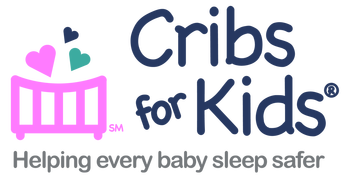 The Cribs for Kids program of Southern Tier Health Care System (STHCS) helps families by providing a Pack 'n Play portable crib and safe sleep education to low-income families who, otherwise, would be unable to afford to provide a safe sleeping space for their baby. This keeps babies on their own separate safe sleeping surface and reduces the risk of infant death. Since 2016, the first year of the Cribs for Kids® partnership, we've provided over 200 cribs and educational materials to low-income families. 70% of the families we helped made less than $10,000 annually and 90% made less than $20,000. This program is reaching the families that need it the most and helping babies in our communities sleep safely. How does the Adopt a Crib Campaign Work? The Cribs for Kids program of STHCS is a donation driven program. We rely on the generosity of our local communities to support our continuing work. The Adopt a Crib campaign is a simple way to support the Cribs for Kids program and help keep babies safe. When you donate to the Adopt a Crib campaign, the money will be used to purchase a Pack 'n Play portable crib and a fitted sheet for the crib mattress. If you wish, we will recognize your generosity by labeling each crib you adopt with your name or the name of your organization. We'll also thank you for your donation on our website and Facebook page. ​All donations are tax deductible and help families in the Southern Tier. How can I Raise Money to Adopt a Crib? There are tons of great ways to raise money to Adopt a Crib. Be creative and have fun. Here are some ideas to get started! Get together with other families or friends and split the cost of a crib. With 5 people working together it only takes $11 from each person to Adopt a Crib. Is a baby shower in your future? Ask the people coming to the baby shower to bring a small donation to Adopt a Crib and help a low-income family. Is your baby having a first birthday party? Adopt a Crib in your baby's honor and help another local infant make it to his or her first birthday by providing a safe place to sleep. Adopting a Crib is a great way to recognize your parents for Mother's Day or Father's Day. Have you or a loved one experienced the loss of a child? You can Adopt a Crib in memory of him or her. You can also continue to support the program by doing your shopping through Amazon Smile. There is no cost to you and all Amazon prices remain the same! Click here for more information. Have a jeans day. Ask your employees to make a donation to dress down and wear jeans to work. Host a soup luncheon. Employees sign up to bring their favorite soup or bread. Set up at lunch time and charge participants a fee to enjoy all of the delicious soups. Get the students involved by having a Crazy for Babies Day. Hold a crazy hair or other crazy-themed day (crazy hats, crazy clothes, crazy socks, etc.) to show that your school is crazy for babies. Students make a $1 donation to participate. Hold a Who’s the Cutest Baby competition. Post a display of baby pictures of teachers and staff members at a central location in the school. Put out a labelled collection container for each teacher. Have the students vote for who they think the cutest baby is by bringing in donations and putting them in that teacher’s container. The teacher who has the most money in his or her container is crowned the cutest baby in the school!